Asa Lacy’s first subpar outing of the season combined with an abysmal day at the plate caused the No. 10 A&M baseball team to fall victim to No. 22 Auburn, 7-0, on Saturday night at Olsen Field. The previously unblemished Lacy got a quick groundout in the first inning but struggled with his command as Kason Howell and Edouard Julien each smacked hits to put ducks on the pond. The southpaw then lost control of a fastball which scored Howell. Designated hitter Conor Davis then blasted a two-run shot to right center to cap a three-run first frame for the Tigers. Asa Lacy had his first disappointing outing of the year against Auburn on Saturday. Lacy didn’t have his best stuff for the duration of the outing but was able to prevent the Tigers from plating any more runs in his 4.2-innings of work. The sophomore finished the evening with four strikeouts, three earned runs and seven allowed hits. Chandler Jozwiak replaced Lacy in the fifth and put together an impressive relief appearance. The Brenham-native kept the Aggies in the game, tossing three scoreless frames before running into some trouble in the ninth. Auburn starter Brooks Fuller gave the A&M offense some trouble, allowing just four hits in 6.0 innings of work. The Aggies combined to go 5-for-29 (.172) on Saturday night with just four Aggie players notching hits in the game. “They were much more competitive from an offensive standpoint today, and it was obvious if you were at the game today,” Childress said. Mikey Hoehner led the effort with two hits. The catcher said that the Aggies are having trouble with consistency right now but doesn’t feel like they are far off from being where they need to be. 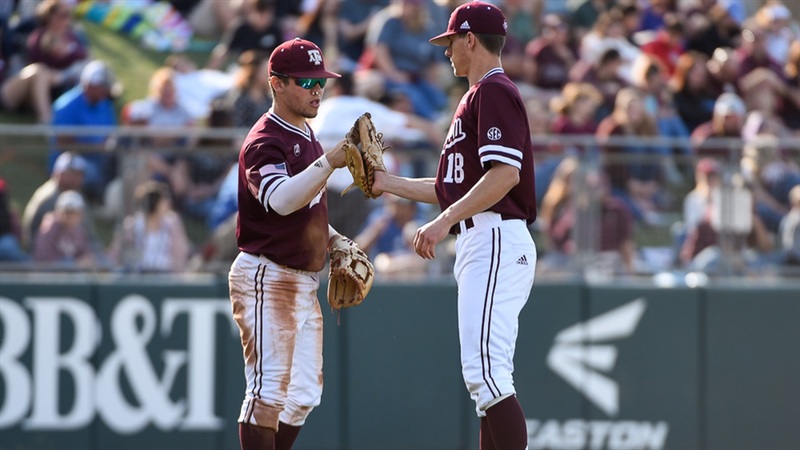 The Aggies will look to employ those adjusments and revamp their approach tomorrow afternoon as they host the Tigers in a series-deciding game three. That game will be televised on SEC Network+ with first pitch slated for 1:02 p.m.